Greetings! I promise to post more personal stuff over the coming weeks about my trials and tribulations around cycle-commuting, kids, water, co-workers and sweaty tight pants, but for now I wanted to share this! The Region of Waterloo is looking for volunteers for a GPS Cycling Study to assist them with understand where riders go during the winter and how best to assist us in going year round. So check it out. Do you enjoy cycling? Do you wish Waterloo Region was more cyclist-friendly? Here is your chance to help make it happen! WHAT IS IT? The Region of Waterloo and the University of Waterloo are conducting a GPS Cycling Survey to help the Region update its Cycling Master Plan. Volunteer cyclists are asked to carry around a GPS unit for a 2-week period, complete a cycling survey, and complete a one-day travel diary. The GPS unit itself is quite small; about the size of a large USB stick. 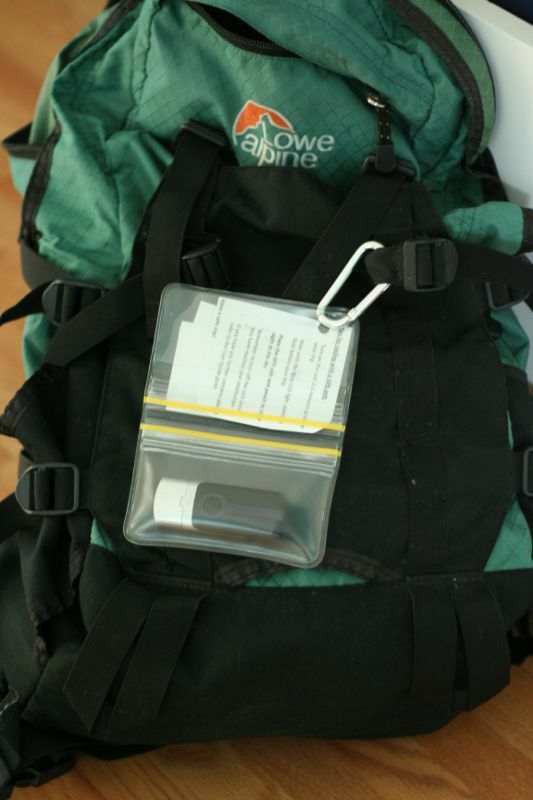 It can easily fit in your jacket pocket or knapsack, but should be kept visible while you cycle. We have attached lanyards so they can be worn around the neck while cycling. WHY ARE WE DOING IT? To find out where the most popular cycling routes are and what cycling facility and infrastructure types are most preferred. Results from this survey will be used to update the Cycling Master Plan and determine snow clearing priority routes for cyclists, which could improve winter cycling in Waterloo Region. WHO CAN TAKE PART? All cyclists in Waterloo Region are invited to take part. It doesn’t matter if you cycle long or short distances, use trails or roads; if you cycle this survey is for you. Tell your friends! WHEN? This survey started in March 2010 and will continue until early 2011. The Region has purchased 50 GPS units for this survey, which are rotated to volunteers on a monthly basis. WHERE? Anywhere in Waterloo Region, including: Cambridge, Kitchener, Waterloo and the Townships. HOW? Contact John Hill, Principal Planner at the Region to sign up today! Fyi, the inside scoop is they use a CanMore GT-730FL-S GPS. I’ve signed up! Will you? I’m carrying the GPS now on my way around town by bike. I couldn’t wait to get on this opportunity to provide feedback for infrastructure improvement. The most onerous part is remembering to turn it on before you take off. That’s pretty cool. I wish Brock U and this city would do something similar.